The LaCie 301138U Ethernet Disk Mini 500 GB Ethernet/USB 2.0 External Hard Drive works with and without a network, either as a cost-effective data server for your home or office, or as personal storage. Features built-in Gigabit Ethernet for blazing fast network storage. Has 500 GB of storage space for digital media and other files. Allows for streaming of digital media files via a uPnP player. Featuring a built-in GigaBit Ethernet, the Mini lets Windows, Mac, and Linux users across your network share files quickly and seamlessly. In your home, you can share all your vacation and travel experiences with the rest of your family by simply dragging and dropping files into the drive. With 500 GB of space, you can store up to 35 hours of DV video or 135,000 or over half a million photos. The drive also features a USB port which can be used either for direct connection to a computer, or when networked, to connect another external drive which will then also show up as a networked drive. The Ethernet Disk Mini can also function as a home multimedia server, letting you stream digital media files to your TV and audio system via your UPnP AV-compatible digital media player. User-friendly installation and a Web-based administration interface makes network configuration and set-up easy. The drive also includes 1-click Backup Software, letting you easily protect the important files on your computer. The elegant, silver case, designed by internationally acclaimed designer Neil Poulton, will enhance the aesthetics of your desk or workstation. To keep background noise to a minimum, the drive features a smart-fan design that powers on only when needed. 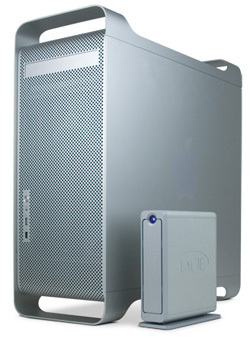 The LaCie Ethernet Disk Mini Home Edition features a rotational speed of 7200 rpm, a cache of at least 8 MB, and a 400 MHz processor with 64 MB of RAM. 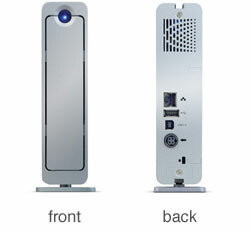 The drive measures 1.7 x 6.3 x 6.8 inches (WxHxD) and is backed by LaCie's 3-year warranty. LaCie 301138U Ethernet Disk Mini, Ethernet cable, USB 2.0 cable, external power supply, drive stand for upright use, LaCie Utilities CD-ROM with user manual, and quick install guide. This product was installed on my network very easily. I was able to map the drive to it and begin backup. Then it gives me an I/O error that happens within a few minutes of every reboot. This makes the drive inaccessable. Now I will have to try to run some things to get the drive working again. Interestingly, the ethernet utility I downloaded from them does not recognize the drive. Unfortunately, I cannot say how it works because it hasn't from the very beginning. None of my laptops (XP and Vista) could have access to share. My problem doesn't show up on the FAQ, so I am stucked with an unresponsive mail support. 3GB transfer said it would take 3 hours. Just got an RMA from Amazon to return this drive. I looked to reformat, but it wouldn't give me any formatting options except for XFS. As a comparison, when I connect via ethernet to my network and transfer a 3GB movie to my AppleTV, it takes 3 min. I'd rather get a external firewire drive and share it. This product come to me one week ago. It has been working good for 2 hours. At the beginning, while copying file on it, it gave I/O error. After one day it crashed completely. This unit is slow. I do mean slow. I read reviews about this being slow, but I could not of imagined it would of been that slow in transfer. I had this hooked up to a 100MB network and it would take hours and hours to transfer such little data. I would have to leave it running over night just to back up files. I though hooking this up through the usb 2.0 port might be faster, however it still goes via the network and just as slow. The power draw on this box is very high at about 70w. Add that the lots of extra hours I needed to leave computers on to transfer files and the money in electricity I wasted. There is no sleep mode or low power mode I could see, it just runs all the time. Sure I could shut it off when not needed and turn it on again....but I might as well have a usb drive. 1) GOOD: This product works just fine with Windows XP. My XP-based computers can see the device on the network with no problems. Getting files to and from the device is easy - just hook it up to the network (such as a wireless router), follow the instructions for setup, and you're done. Also, the unit is very quiet and takes up very little room. 2) BAD: All configurations for the device are done on a crappy website with slow functionality. The interface is bland, it's not user-friendly, and almost looks like it's meant for a computer guru in some places. They put this site together to get the job done with no regard for the ease of use - but, hey, it does get the job done. After testing the device i noticed that most brands do not show actual transfer speed and only spec upper boundary using network or usb2 theoretical limitations. That is a LIE! This device gives you at most 4MB/s no matter what network you use!!! The internal CPU/Board are simply not fast enough!!! The existing USB port is another lie, since it does not function as a regular usb drive but create a network over usb2, having the same internal board limitation. This external drive has some decent features. The underlying FS is XFS powered by an embedded Linux OS on ARM. Supports CIFS, FTP, HTTP, and Bonjour protocols. And external USB drive connection is possible for future expansion.